We’d love your help. 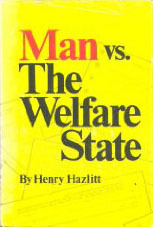 Let us know what’s wrong with this preview of Man vs. the Welfare State by Henry Hazlitt. To ask other readers questions about Man vs. the Welfare State, please sign up. This is a great book and still very relevant, in fact its more relevant today than most of the stuff written on politics today! The welfare state is a self-propelling doom machine and Hazlitt explains why, using both good economic logic and historical examples. This should be required reading for all school aged children so they can enter the world with a true understanding of taxation and welfare. "Man vs. the Welfare State" is a profound analysis of the effects of the so-called "welfare state" over both the economy as a whole and, in some cases, the groups of people living in it as well. Hazlitt, being very literate in field of economics, especially considering that he was a journalist (and his deep knowledge is something we rarely notice in the profession these days, unfortunately), offers case by case study of the damages of the social programs. In his book he examines not only concret "Man vs. the Welfare State" is a profound analysis of the effects of the so-called "welfare state" over both the economy as a whole and, in some cases, the groups of people living in it as well. 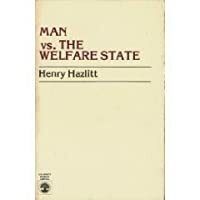 Hazlitt, being very literate in field of economics, especially considering that he was a journalist (and his deep knowledge is something we rarely notice in the profession these days, unfortunately), offers case by case study of the damages of the social programs. In his book he examines not only concrete projects and endeavors of the state, such as medicare, the pay-as-you-go pension system, and the foreign aid programs, but also dismantles some of the worse theoretical "advancements" of the time. One of the most notable of them is John Kennet Galbrait's view of the dysfunctional free market, in which consumers are almost entirely driven by the advertising industry, lack will of their own, and tend to spend the money they earn for unnecessary products and services. Of course, Hazlitt does not narrow his analysis in the situation in the United States only, but gives dozens of concrete examples of the disastrous consequences of the welfare programs in other countries as well (probably Uruguay being the most striking example). Furthermore, he explores topics, such the dollar debasement through means of printing money (i.e. inflation), the necessity of the classical gold standard, the effects of price controls, and the need of a genuine free market as a path to economic growth and genuine, not nominal or statistical, enrichment. One of the extremely interesting parts of "Man vs. the Welfare State" is the comparison between 1884, as presented in the writings of the great classical liberal (in the European sense) Herbert Spencer, and 1984, as presented in the notable novel with the same name by George Orwell. In this section the reader will learn the true history of the regulation in the Anglo-Saxon world by this point (spoiler: there already was a significant level of state regulation and union control over the economy). In the end of the book he takes some time to examine the necessary steps towards the reduction of the welfare state - a very interesting topic, which, to my knowledge, rarely gets discussed in books. As a whole, "Man vs. the Welfare State" is an awesome introduction to a very important topic - the effects of the "social" programs over the economy. As such, I highly recommend it to everyone, especially to newcomers to the field of economics. Read this book and you will be worried about the state of freedom in America.